(16/P127) TRENTON – The New Jersey State Park Service invites residents and visitors to start 2017 on the right foot by taking part in fun, invigorating and educational outdoor activities to be offered statewide as part of the annual America’s State Parks First Day Hikes initiative on New Year’s Day. State Park Service staff and volunteers will conduct 21 guided hikes, walks and interpretive tours, as well as two bike rides and a horseback ride at state parks, forests and historic sites across the state. The hikes are designed to showcase many of the natural splendors of New Jersey’s diverse network of parks, forests and historic sites. They range from short hikes that can be done by just about anyone to a 15-mile, daylong hike for the more ambitious. Hikes will take place at Bass River State Forest in Burlington County, Belleplain State Forest in Cape May County, Cheesequake State Park in Middlesex County, the city of Elizabeth in Union County, Kittatinny Valley State Park in Sussex County, Monmouth Battlefield State Park in Monmouth County, and Parvin State Park in Salem County. They will also take place at Rancocas State Park in Burlington County, Ringwood State Park in Bergen and Passaic counties, Round Valley Recreation Area in Hunterdon County, Stokes State Forest in Sussex County, Washington Crossing State Park in Mercer County, Waterloo Village in Sussex County and Wharton State Forest, located north of Hammonton in Atlantic County. Some unique offerings include exploring the historic settlements and natural wonders of the Pinelands, horseback riding along scenic trails of the Kittatinny Valley, hiking up to a New Jersey Forest Fire Service tower in Stokes State Forest, following the route the Continental Army took on Christmas Night 1776 on its way to a crucial victory at Trenton, and walking the hills and expanses of Monmouth Battlefield State Park, where General Washington rallied his underdog troops to a key victory against the British. A new addition this year is the Tour Historic Midtown Elizabeth hike, which features a 1½-mile hike of the city that includes historic Boxwood Hall, home of Elias Boudinot. Boudinot served as President of the Continental Congress from 1782 to 1783, was a signatory to the Treaty of Paris, which ended the Revolutionary War, and served as U.S. Representative for New Jersey from 1789-1795. 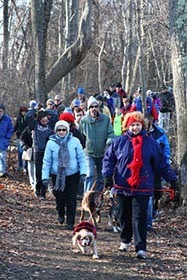 The New Jersey State Park Service has been participating in First Day Hikes since it became a nationwide event in 2012. First Day Hikes originated more than 20 years ago at the Blue Hills Reservation, a state park in Milton, Massachusetts. The program was launched to promote healthy lifestyles and year-round recreation at state parks. 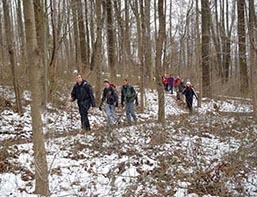 “The New Jersey State Park Service is proud to again be participating in this national program that gives people an opportunity to celebrate the new year by connecting with the outdoors and learning about New Jersey’s natural resources, diverse landscapes and rich history, all while having fun with friends or people they’ve just met,” said Division of Parks and Forestry Director Mark Texel. The Division of Parks and Forestry manages nearly 450,000 acres, including 40 State Parks and 11 State Forests. In addition, the DEP’s Division of Fish and Wildlife manages about 347,000 acres as multiple use Wildlife Management Areas.